Launching your business to a new market can be extraordinary, but, without the right direction and staff can appear many problems that collapse your company. AAC contributes to your company the knowledges and experiences for facilitating the process. The transition to a global market contains differences in language, culture, legislation and the way business is understood. We are experts in these areas, guaranteeing that your company will arrive to the next level. Commitment AAC. Your company internationalized, with presence in more than 10 countries in 18 months. 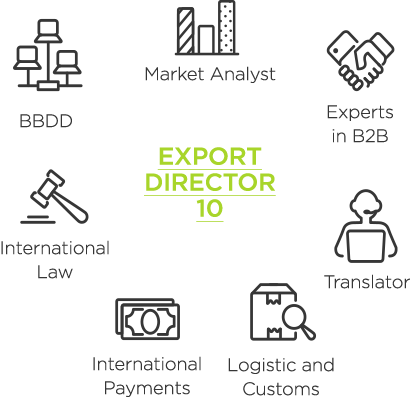 Fixed salary of an export assistant + variable to success. More than 30 professionals of international trade from different nationalities form a structure inaccessible for the most SME. Dozens of companies successfully internationalized. Without structural expenses such as: telecommunications, contracting, social insurance, holidays, training, casualties, etc. Own structure in strategic countries and connections in more than 100 countries. Profitable department: 4 times more than an internal department.